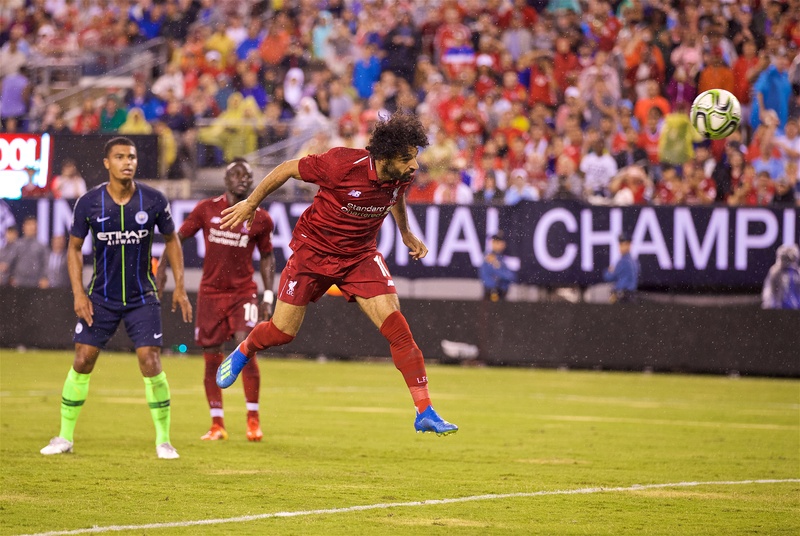 Mohamed Salah and Sadio Mane marked their returns to action for Liverpool with a goal apiece to help Liverpool to a 2-1 win over Manchester City in the International Champions Cup tie in New Jersey. After a goalless opening 45 minutes, the Blues took an early second-half lead when Leroy Sane raced clear and found the bottom corner with a neat finish. 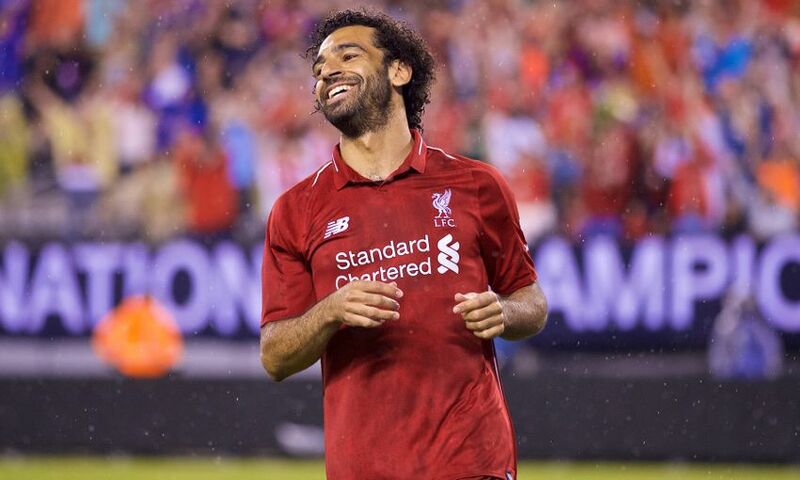 However, the Reds introduced Salah just after the hour – and he took less than 70 seconds to make his mark when he headed in Rafa Camacho’s cross from six yards out. And Mane secured the win for Liverpool deep into stoppage-time when he converted a penalty after Dominic Solanke had been barged over inside the area. Ahead of the game, it was confirmed Georginio Wijnaldum would make his first appearance of the summer as he started in midfield, while Salah and Mane were joined by Marko Grujic on the bench. City fashioned the first chance of the game as Riyad Mahrez played Lukas Nmecha into a shooting position just inside the area. Loris Karius was able to repel his effort, but the rebound fell back at the forward’s feet, who scooped wide under pressure from Fabinho. Liverpool’s maiden attempt came via the right boot of Curtis Jones, who cut in from the left and struck goalwards; however, it was too close to Claudio Bravo to trouble the ‘keeper. Next, Brahim Diaz’s instant return to the Reds’ goal from Karius’ punch clear at a corner was straight at the German custodian. Adam Lallana then prodded a half-volley an inch wide of the post from a corner after the ball had looped into the air before Jones stung the palms of Bravo with an edge-of-the-box drive. The Liverpool youngster went even closer on 41 minutes when he met Nathaniel Clyne’s delivery with a firm header six yards out, though he planted it narrowly over the crossbar. Jürgen Klopp made five changes at half-time, including the introduction of Mane. Also coming on was Academy goalkeeper Caoimhin Kelleher – and he needed to pull off a save at point-blank range to deny Sane a tap-in six minutes after the restart. Solanke had the ball in the net shortly after when he converted from Virgil van Dijk’s knock-down at a corner, but City took the lead in the 57th minute. Sane sped clear to reach Phil Foden’s pass in behind and swept low across Kelleher and into the bottom corner. Just after the hour, Salah made his entrance into the action – and he required less than 70 seconds to make an impact. The Egyptian demonstrated the kind of anticipation he displayed time and time again last season to meet Camacho’s cross from the right and head in beyond Joe Hart. Despite only returning to training last Friday, Salah was causing panic in the City defence. A header from a Mane cross was blocked on the line by Cameron Humphreys and then the No.11 struck the top of the crossbar from Camacho’s through ball. The substitutions had helped Liverpool seize control of the encounter – and Mane had two chances in quick succession to put them ahead when he first side-footed wide from a Salah cross before shooting into the side-netting from an angle having rounded Hart. But Liverpool were awarded a penalty in the second minute of stoppage-time when Tosin Adarabioyo barged into the back of Solanke. Mane assumed responsibilities – and duly dispatched from the spot to win the game for the Reds.